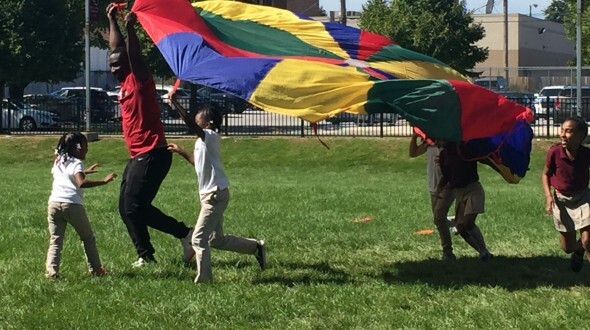 Urban Initiatives co-founder and Executive Director, Jim Dower can often be heard saying that “play is a right,” but in many Chicago Public Schools students don’t have access to enriching opportunities to play. Urban Initiative’s recess program Play with Potential aims to change this by providing structured recess replete with opportunities for social-emotional learning and play. Our evaluation team has recently finished analyzing the data to learn the impact of the Play with Potential program throughout the 2016-2017 school year. Play with Potential’s curriculum is intended to provide students with a safe, fun space to play in addition to fruitful opportunities for social-emotional learning, increased levels of school connectivity, and valuable physical activity. In 2016-2017, the Play with Potential program was in 18 schools and served over 11,000 students. Overall, 82% of students observed at PWP schools engaged in moderate-to-vigorous physical activity at recess, compared to 66% of students at control schools without our program. This physical activity is an exceedingly important part of the school day as students have a chance to get their bodies moving, refresh their minds for more learning, and increase their physical wellness. However, physical activity is only a portion of the Play with Potential curriculum. The other part of the equation is the social-emotional learning aspect of recess. Recess is an opportunity to build social-emotional learning as students interact with their peers in a different environment than in a classroom. Recess has the opportunity to build inclusivity and feelings of community within a school and this year we are proud to report that students at new PWP schools reported nearly a 10% increase in feeling like part of the group at recess by the end of the year, as well as a 10% increase in feelings of overall connectedness to others at their school. Additionally, 76% of girls observed at PWP schools engaged in moderate-to-vigorous physical activity at recess, compared to just 55% of girls at control schools without our program. Building inclusivity for all students and enhancing gender equity in play are two incredibly encouraging outcomes from the Play with Potential program this year. Overall, students across all PWP schools reported a 5% increase in enjoyment of sports and games at recess. Notably, this number increased to a 9% increase for students at new PWP schools, and to nearly a 7% increase for younger students in the program. Play with Potential has achieved so many incredible milestones in the last year, and we are excited to continue building up our students and utilizing play to enhance school communities in the coming academic year.